Upon walking out of the theater, there was a strange feeling my mind had. It was almost like my eyes swelled up to the size of Beaker’s from The Muppets. There is no other movie I can think of that left me feeling amazed and shocked at the same time. In many ways, reviewing “Sausage Party” is hard because this is truly a movie that must be seen to be believed. It’s unapologetic, its stereotypical, its dirty to the max, its a cesspool of swears and innuendos, its insane but I enjoyed every minute of it. “Sausage Party” becomes more of a view on religion and beliefs without taking a brutal beating to it. Much like with Monty Python, the comedy on the subject matter is handled well by taking satirical jabs as opposed to stepping out and making mean ramblings. One such example is a Jewish bagel arguing with a Muslim lavash about how different they are. But not by what kind of product they appear as, they argue about different beliefs and the common misconceptions with their religious customs. As the lavash dreams how he wishes to be bathed by 100 bottles of virgin oil, the bagel disagrees with the “pure nature” he proclaims. A little predicable but the delivery makes it worth the laughs. Seth Rogan plays the lead named Frank, a sausage who gets lost from his cart during a accident. While seeking to be back on the shelf, Frank starts to question not only his purpose, but also the value of why food exists. Even if we know what happens to food, the joke is funnier when we see his reaction to the terrible truth and wonder just how he will coupe with it. As always, Rogan is a lot of fun bring a manic energy while knowing when to be charming and likable. Kristen Wigg is surprisingly funny voicing Frank’s girlfriend Brenda, a hot dog bun who wishes for…she’s a hot dog bun. What do you think is on her mind? Perhaps interesting is how Wigg’s character is used for a counterpoint as Brenda feels the humans (or “Gods” as they are referred to) are not ones to mess with still having faith in the food’s belief system. Even more startling is Wigg’s raunchy style of comedy is let loose to some welcome and hilarious lines. Coming of off “Ghostbusters,” I felt this movie suited her better to allow more breathing room for her shtick. Her character is more than a one note walking “hot dog in bun” joke. Brenda starts to question if the value of life should truly be questioned while also wondering if morale code should be worth sticking to. Speaking of which, the best way to describe the movie and its comedy is very much if “The Brave Little Toaster” was directed by John Waters. Just when you think the opportunity to joke about sentient groceries are wearing thin, another joke lurks around the corner unexpectedly. There are moments in “Sausage Party” where on paper is sounds dumb, but then you see the clever side of it once it gets executed. This is notable in a scene when one of the sauasges (Micheal Cera) has an encounter with a druggie who goes on a “bad trip.” Every joke seeks a good opportunity into what kind of life this addict has along with the kind of things that would happen on a drug high. It hits bullseye without missing a single beat. The only problems I have with “Sausage Party” are surprisingly minor. In this universe, people can’t see the food walk and talk unless are drugged up. This leads to a curious question of how the products look in the eyes of a human being in reality as opposed to the reality of food. This is evident in a gag when two baby carrots try to run and it shows a shot of them running. It then cuts to a shot of the lady seeing two carrots rolling off the counter showing “reality’s perspective.” There were points when I did question what would certain moments look like from reality’s point of view as food runs across floors or mingle with each other. There is one other nitpick and it’s aimed at the final joke in the movie. Instead of ending on a high note, it breaks the fourth wall in a way so bizarre that I questioned if it was ever needed. Even a friend of mine agreed that the scene preceding it would have just been fine to end on. After a climatic and jaw-dropping moment, they try to sneak in one more jab that could have been easily cut out seeing how little it effects the story. But for what’s worth, “Sausage Party” is worth the recommendation. There are moments that I still can help but snicker over they appear in a movie like this. I enjoyed the jokes, the characters and theological stuff as well. Its that one summer surprise that packs tons of laughs and plenty of creative effort. Now as expected, children are not the target audience for this movie. In fact, I do question if parents will be that dumbfounded to take them to see it despite the marketing clearly saying its R-rated. For those curious fools who think a tyke will sit through it, I wouldn’t even attempt it. I predict that it will be a movie that will keep kids far away from the refrigerator as possible as adults laugh over the absurd nature this movie brings. When one brings up “Finding Nemo,” most attention turns to the character Dory. A small blue fish, voiced by Ellen DeGeneres, who has trouble remembering mostly anything. Instead of an annoying running gag, Dory was an interesting character. The fact she is struggling to think back and maintain her previous thoughts was well written and knew when to be funny. “Nemo” still holds up enough on its own, but was this sequel worth the 13 year wait? The plot nearly rehashes a good bulk of material from the first movie, but at least it has the advantage to expand on a few things. The first third is mainly comprised of scenes from the first movie as an attempt to remind viewers of previous events. Instead of an angler-fish for example, our heroes get briefly menaced by a giant squid. This is mostly one problem I have with “Finding Dory” as certain moments almost feel like a rehash of the first film. This is the standard trap most movies like “Ghostbuster II” and some of the “Pink Panther” movies where it rehashes some material instead of giving new stuff. Thankfully, that is not the case here. The final 2/3rds focus on the new environment our characters go to and certainly a lot more exploring on Dory’s character. Instead of a comedic sidekick, we dive into the backstory of this odd fish and how she was separated from her own parents. The search for her folks moves on as it leads them to an aquarium that acts as a hospital for Marine animals. This opens the door to see new creatures and view the world of what a zoo would be like from the eyes of an animal. It leads the way for some clever gags like a “touch pool” and incredible visuals like a massive tank full of different fish. Fans of the first movie will be happy to hear Dory is great as ever. Ellen’s innocent yet playful personality leads to some funny moments, but even some heartfelt ones. As we progress on the search for Dory’s parents, the story allows this character to be explored more in different ways. 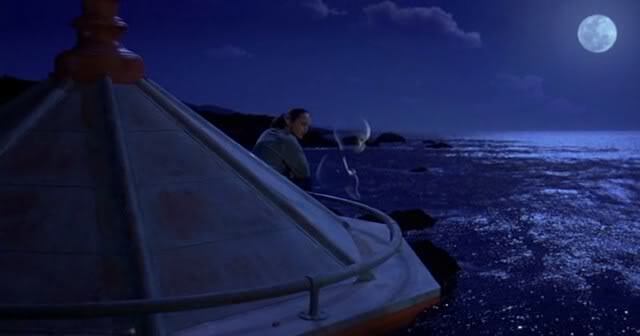 Certain moments from “Finding Nemo” are called back, but feel expanded on (the line “I remember it…because when I look at you, I can feel it. And I look at you, I’m home” has more deeper meaning than before.) We get treated to key flashbacks that act like visual clues to the viewer before the final revelation comes into play. Both act as a prequel that is satisfying and useful to expand into Dory’s origin. Again, much of the movie teeters on feeling recycled but instead does it in a fresh manner. Instead of the “Tank Gang,” we get a couple of Marine animals waiting to be set back into the ocean or enjoy life. Highlights include a beluga whale (Ty Burrell) who self-doubts himself, a whale shark (Kaitlin Olson) who was a childhood friend and even a couple of sea-lions that are territorial like the pelicans and seagulls from the first movie. Each has their own quirk and personality that helps them stand out and become much useful later on. Perhaps the soul character who will be talk of the town is Ed O’Neill as Hank, a grouchy octopus that is interested in breaking out to another aquarium for selfish comfort than return to the ocean. The minute this suction cup inhabited, CGI creation first appeared, it had me in stitches. Hank is, without a doubt, one of Pixar’s best characters since Sadness or Bing Bong from “Inside Out.” Not only do I love the “Grinch”-like personality, but just the way it moves sly and quick around the aquarium. It serves as a bigger challenge for the workers as Hank uses tons of camouflage methods in order to blend in. Truly the animators had a lot of fun and creativity behind the ways Hank could hide or change color. The movement alone is almost reminiscent of a fast paced Chuck Jones creation, but knows when to slow down for a bit. For most of the summer, there hasn’t been a single movie I’ve seen that makes me really say “this is what a summer movie should be.” “Finding Dory” comes close to being this level if it weren’t for a few things. I wish the “rehashed” bits in the first third were better done and there is one small dark turn that feels almost unnecessary. Though this “small dark turn” only lasts for a few before turning into an upbeat moment, it still has decent build up. I do admire the twists and obstacles that get thrown out as we start to wonder just how Dory will be able to achieve that happy ending. Even more, “Dory” is probably the most unique in the Pixar batch for being a movie less about discovering family and more on learning to live with disability. We met these characters who have personal problems and some with internal flaws that can’t be dealt with easily. As Dory struggles to overcome her memory problems, we want to see her succeed instead of laughing at her pity. Its rare for a movie to help coupe with those who have problems like this to tell them its ok to live with these things. And honestly, I’m good with that. However, parents be warned. Some parts of “Finding Dory” might be a tad intense for younger viewers. From a thrilling squid chase to (again) a certain dark moment near the end, this has material that might upset some kids. While its nothing traumatizing or brutal (like say “Good Dinosaur”), it more feels like the same level of intensity as the first movie. If your kids saw “Finding Nemo” and was ok with the peril, they should be fine then. On the bright side, we do get a cute short call “Piper” that might be able to calm some sensitive viewers down. In connecting with the main theme of the movie, we get treated to a tiny bird who is trying to overcome a big obstacle. In a nutshell, the animation was stylish yet fluffed enough to not deter from the Pixar style. And when a heartwarming short and a good movie go hand in hand, you know your ticket price was worth it in the end. The trailers and promotional material appeared to paint “Zootopia” as this fun, little adventure for kids. Much to my surprise, the themes got deeper and edgier as things went along. Elements of racism, stereotyping and even drugs were present for such a simple family film. However, it didn’t matter if these hot topics where in this because I felt everything was delivered and executed perfectly enough for a fun ride. When watching this world of a metropolis city for animals, things like “Rocko’s Modern Life,” “Futurama” and even “The Amazing Adventures of Gumball” came to mind for different reasons. “Rocko” showing how absurd and outlandish life can be in the simplest of things. “Futurama” for not being afraid to discuss social issues in a lampoon manner. And “Gumball” because a concept like this can be easily crafted by a kid. Seeing these things blended into a unique, rich and engaging feature was rather amusing to me. “Zootopia” opens up with a small piece of exposition talking about how things came to be. Thankfully, its done in a manner that catches you off guard while still explaining what kind of word you are in for. Again, the idea of a place inhabited by anthropomorphic animals is nothing new. The way its done here, I feel keeps the originality fresh. Something simple as media manipulation and the whole place falls apart much like our world. And for a family feature to mirror today’s problems is very hard to find. In one scene, a character reflects her current situation as a cop stating “We were supposed to protect.” Perhaps I’m looking too deep in, but this scene sent chills reminding me of how today we are still questioning honesty of an authoritative figure like the police. Social issues aside, the main story doesn’t deviate as a rabbit named Judy Hops (voiced by Ginnifer Goodwin) wants to a police officer in this grand city. We root for her not because of the motive, but how we don’t want to see her give up. Set with an optimistic personality, Judy hopes to make a difference in a world that is cynical and prejudice behind the bright colors. Being the first bunny on a team of cops ranging from wolfs to rhinos, we can already tell the level of difficulty from how everyone around her sees this rabbit by animal kingdom status and not personality. Opposite to that is a red fox named Nick Wilde (Jason Bateman) who is aware of Zootopia’s discrimination to the point he’s against it. Instead of going against the labeling, he’s a victim to acting out as a small-time con man. Despite his negative viewpoint, there is a sense of sympathy sharing the same problem Judy has. Both want to make a difference, but everyone around them views their placement as a predator and prey to the point judgement is made from a simple classification. When it doesn’t discuss social issues, we get a variety of comedy in many places. Ideal jokes like having sloths run a DMV makes for some great gags. The slow pace of a sloth reflects how irradiated we are with the plodding of an actual DMV. These jokes are not cobbled together randomly and you can feel there is effort behind them. The buddy relationship between Nick and Judy is entertaining as well. Both playing off their sly wits as Nick uses his con skills while Judy keeps firing back in brainy ways that could make Brer Rabbit envious. Is “Zootopia” completely perfect? I wouldn’t go that far. There is one minor thing I would have to nitpick about and it involves a key twist. As it turns out, a good bulk of mammals turn up missing but found to be going back to a primal state. A supposed mastermind is behind this and once it gets revealed, the shock sort of wasn’t there. Dare I say this was a twist I did see coming after two key scenes much earlier in the movie. Does it break apart everything that has been crafted and tended to? Absolutely not. Twist or not, I was highly engaged into Disney’s latest outing and rather surprised by how it never turned away from such hot topic issues. These were elements you would rarely find in any of today’s family features or even hard to talk about. I’m thankful there weren’t watered down or treated in such a juvenile manner. “Zootopia” is probably the first Disney movie in a long time that has me questioning how can one can slyly reference things in today’s society for all audiences. Well, “Planet of the Apes” did that well with having every chimp and gorilla used as a symbol of social class. And yet even as I write this, I’m still blown away by how anyone working on this movie was able to communicate what is wrong in our society for a family-friendly picture. Color me impressed. Ever since the first Despicable Me movie, viewers have gone nuts for those cute and naughty yellow creatures known as Minions. I do admit, I was really hooked as these supporting characters slapped each other around and that gibberish banter was very amusing. Well, they have a movie out and like many, I was really hyped. There were endless possibilities to what could be done. However, “Minions” seems to cater to the humor than put its cute, chaotic characters in a stronger story. Set up as a prequel, the first 10 minutes are probably the best part as we see these yellow henchman walk on land and find themselves serving dinosaurs and cavemen and later historical icons from Napoleon to Count Dracula. Even if this appeared in the first trailer, these are the funniest moments of “Minions” as its starts off as a “History of the World: Part I” manner with these beings trying to serve a villain but sadly lose them in the process due to great misfortune or just because they mess things up. Unfortunately, that is the start of the picture as the Minion clan seek refuge up north. But soon enough they find that without a master, they have no purpose to continue living. Our plot kicks in as three Minions named Kevin, Bob and Stuart (all voiced by Pierre Coffin) go out in the world to find a new boss. Along the way, we learn things like how they were able to obtain their signature overalls and appreciation for pop culture television. These scenes are cute alone as the three marveling at shopping malls and yellow fire hydrants. Perhaps more notable is a sequence similar to Modern Times when they stake out in a mall much like Chaplin’s Tramp did minus 1960s television and being a vehicle to find out where to find a new master. 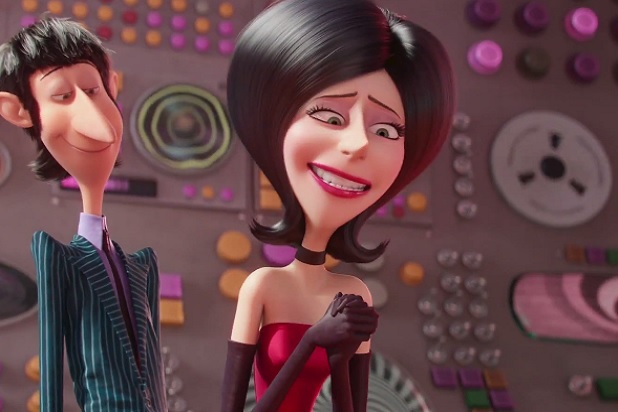 Eventually they do get a new boss in the form of Scarlet Overkill (voiced by Sandra Bullock) whose ultimate goal is to steal the crown from the Queen of England and be the new ruler. Scarlet herself is a lot of fun to watch as Bullock really hams up the performance going from a sweet and innocent mother-like tone to slowly showing her true colors near the climax. Its basically Cruel DeVille if she was a super villain but there is fun here. Also enjoyable is her husband Herb (Jon Hamm) whose beatnik personality is a delight to watch. Some of the quips are not too annoying to the point of cringing but his endless array of gadgets are very creative from lava lamp guns to mechanical arms that are put to good use. As enjoyable as “Minions” gets to be, the true star of the film is not the animation or the Minions but rather the comedy. For those who miss the dark humor of the first Despicable Me won’t be disappointed. The tone can be described as a blend between something along the lines of the Marx Bros and a Charles Addams cartoon. Highlights include our three mischievous characters mistaking a torture dungeon for an amusement park, a funny shot of a line up of depressed Minions trying to visit a shrink and some notable moments in a villain convention. This movie is packed with many sight gags that a second viewing would be required to hand pick every sign and Easter egg the animator’s stuck in. Even a little British humor is injected along with the culture itself with endless 1960s pop culture jokes (as the film is set during 1968 as a time period) including a cute parody of the Beatles “Abby Road” album at one point. Even Queen Elizabeth II is not all she’s cracked up to be fooling viewers into thinking we will see a British stereotype when we see her royal majesty can be quite the fighter. In a sense, British pop culture seems to be such a bigger focus for the second half with elements like the King Arthur legend and some British rock tunes play a crucial part in the story and comedy. 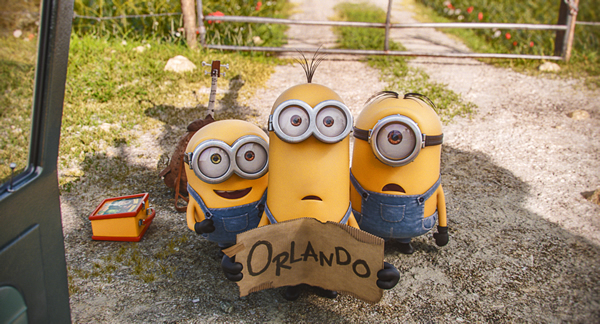 Unfortunately, at the heart of “Minions” lacks a story. Kevin, Stuart and Bob get bounced around so much that we find ourselves wondering what is the main story. We go from an origin tale to a fish out of water to a robbery heist as it all builds to a finale that is fun but a tad fatigued. Maybe there is only so much one can handle of that Minion gibberish that one wonders how their shtick can pad out a 90 minute movie. Perhaps if the film played out more like its beginning as an anthology story with the little guys going from one master to the next, there could be some promise. However, “Minions” is not that kind of movie. Even far from being considered a bad flick. It works better as a mindless comedy and this where my recommendation lies in. If your looking for a film with fast-paced action and really funny jokes, this is worth checking out. On the other hand, there have been mindless comedies before like “One Crazy Summer” and “UHF” that are able to balance a story with a string of bizarre but funny gags. The humor of “Minions” is in the right spot but it left me wishing more was done in the narrative that keeps jumping around. But when there is effort placed in the animation, humor and voice performances, I can’t deny this movie gave me what I wanted and that’s a good laugh. I knew at some point I had to toss in a family movie that had some relevance to the holiday other than E.T. Among the many that get airtime on networks, I’m surprised to see how many times they play the 1995 live-action/CGI hybrid Casper. Its very much become a staple on ABC Family to the point its this generation’s Rankin Bass. Its not Halloween until they play it and its not Halloween without people seeing it. Seriously, its getting airplay at least three or four times this year. But to be fair, I watching movie a lot as a kid and have fond memories remembering what scenes I liked and some notable quotes. But over the years, there comes a point where as an adult, you have to revisit those films and TV shows that you grew up with to see how well it holds up. And for the longest time, I didn’t get a full look because I didn’t think it would live up to my expectations. Thus, I finally sat down to watch one of my childhood favorites and surprisingly, it still holds up. Ok, technically there’s problems but it still holds up in my books. The first problem I should address is how much time we spend with the villain. The first 20 minutes focuses on a greedy woman named Carrigan who hopes spending time with her off-screen dying father would give her some dough. With everything going to charity, she is left with nothing but a condemned mansion in Friendship, Maine (and yes, this town does exist in real life oddly enough.) But it’s revealed a treasure of some value is buried and she plans to see what gold lies in the rundown place. To be fair, Cathy Moriarty is a good actress as playing characters like this but the entire character of Carrigan is just uninteresting. We’ve seen this kind of villain before. Its the Cruella de Vil kind of character that is self-centered and wants what she wants. What saves it from being boring is Moriarty’s performance who is clearly having fun but there has to be more to this character than being a selfish brat that wants hard cold cash. 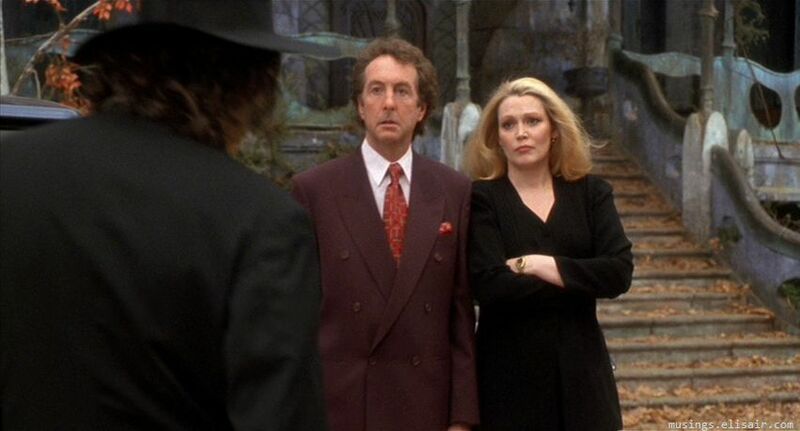 Even at her side is a bumbling butler named Dibs played by a surprisingly unfunny Eric Idle. And don’t get me wrong, I like Monty Python but his character really doesn’t do much for me. He’s the lackey that always gets the shaft and its a bit predicable at times. There’s a moment near the end they do this twist with him trying to turn tables but its very brief and doesn’t affect the narrative in anyway. Well, its revealed the entire place is haunted by a friendly ghost named Casper and his unruly uncles who don’t tolerate “fleshies” in the household. Carrigan tries every method in the book to get rid of them from exorcisms to even a pointless one-note joke of a Dan Aykroyd cameo. Her last resort is in the form of a therapist that claims to have helped ghosts psychologically pass on who agrees to try and rid the spirits with his odd methods. 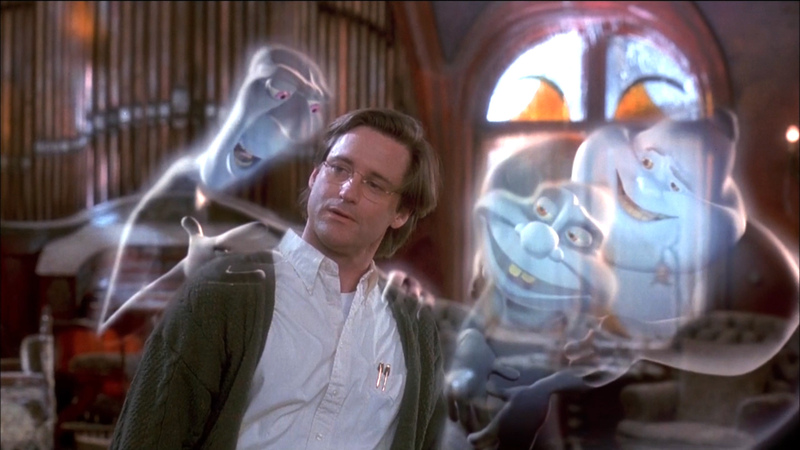 Bill Pullman as Dr. Harvey is not too bad seeing how much invested he is in the supernatural. But at one point, when he runs into the Ghostly Trio, they start to mess with him so much that he acts like he’s doing this for the first time. A bit weird considering someone who claims to have dealt with ghosts before. Its never fully explained if he’s a con man or really dealt with spirits but its up for debate. The center of the picture is really between his daughter Kat (Christina Ricci) and Casper. The two have a connection of social problems and try to work out each other’s faults. Casper is kind but his status as “undead” keeps people away and Kat wants to be a normal teenager like everyone else but her father’s work gets in the way or has trouble fitting in. Its the usual family film teenage schlock but its done ok. Even more so, she the more she bonds with the chipper spirit, the more she learns being a ghost is much harder than living. The way the world of a ghost is simple. You die, you loose memory. You go from hair and clothes, to an abstract blob. At least that is what I get from it because the universe and plot of Casper is so weightless that its hard to consider what kind of story its going for. Heck, the Carrigan character is not bothered with until the very last third and it just feels like she’s tossed in as something to move the story than be an effective villain. 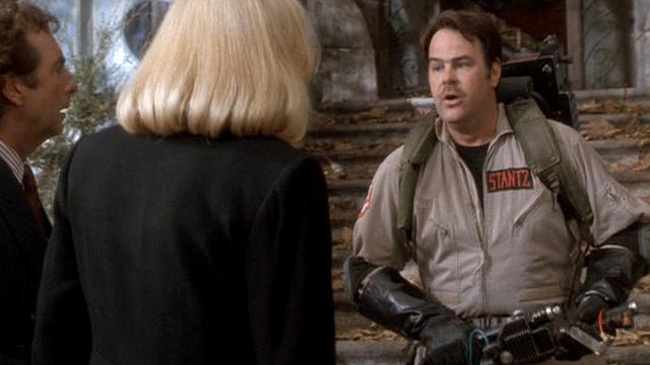 Who you gonna call for a pointless cameo? I’d go into the many problems it has but that would be spoiling a lot for new viewers. In short, the story is not really there and is all over the map. Each moment feels more like a vignette that wonders with a purpose but ends without one. The only one I can think of that truly pays off is a storyline involving Dr. Harvey’s dead wife which I admit concludes nicely. But the rest of the movie feels like its on auto pilot most of the time. For example, when the Ghostly Trio meet up with Dr. Harvey, they try to mess with his mind or at least try and scare him. It leads into this whole fight scene which is cool but what’s the point. How did we go from scare the pants off this guy to fencing with umbrellas in the main hall? Speaking of which, the magnitude of cameos range from enjoyable to pointless. There’s a whole scene where Carrigan hires people to rid the ghosts like Father Sarducci and a Ghostbuster but it feels too obvious. Also, I don’t kids will remember Don Novello’s SNL character THAT well. There’s even a scene when Fatso, Stinky and Stretch posses Harvey into shape shifting into different celebrities. As a kid, I honestly thought it was the Ghosty Trio’s true forms when they were human. But as an adult, they feel like pointless cameos. So for all the negatives, there’s at least some good stuff that balances it out. For one, the CGI is amazing. This is the first film to utilize computer-generated characters instead of using them as effects. You could also argue, its the first live-action/CGI hyrid movie seeing the computer is making characters and not effects. For the longest time, CGI was used to bring things like dinosaurs or morphing effects for movies like Willow or T2. Here, they pushed to the next level by making a three dimensional character as opposed to a special effect. And that is really the true star of the show. There are times I want to marvel at the blend between computer effect and live-action. But it gets so blended to the point I feel like I’m seeing ghosts with a soul and personality. This was ILM in their prime and it shows. As said before, the stuff with Dr. Harvey and her daughter Kat are the better written parts of the movie. I feel its also because of how much they sell the fact they are interacting with CGI effects to the point you really feel like they are there. They are practically talking, fighting, flying and interacting with something not there which isn’t easy to do. They way they play off these characters can be a lot of fun. Again, Casper and Kat trying to fit in with who they are and Dr. Harvey’s long battle with the Ghostly Trio. Speaking of which, Fatso (Brad Garrett), Stinky (Joe Alaskey) and Stretch (Joe Nipote) are surprisingly entertaining. 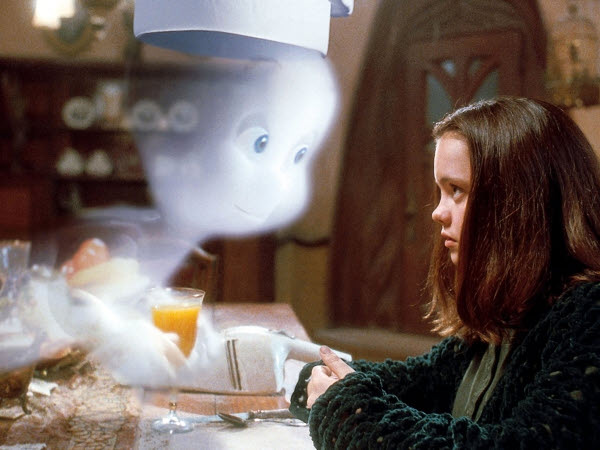 I find myself wishing the whole movie was more about them and less about Casper at times. Not to say that friendly spirit is uninteresting but there’s so much material written for these three that I can’t help but smile when I see them. Yeah the stuff they do is mean and cruel but they are just poltergeists. You expect them to be these nasty spirits that are mischievous and dangerous to be with. They are a huge highlight of the movie and even if some of the pop culture jokes they spew is unneeded, it still gets a laugh by the timing and delivery. 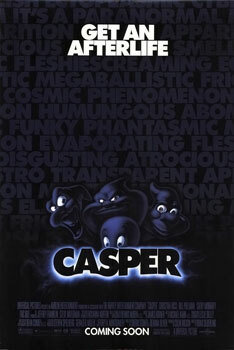 To say Casper is a perfect movie is an understatement. Its really a technical achievement but still packs entertainment value. The whole tone of the movie is so cartoony that you can’t help but admire its light tone and comedic beats. And that’s the correct term here, its a cartoon. Its very much what Roger Rabbit did for hand-drawn animation as this movie did for CGI animation. It provided you can give a three-dimensional being heart and soul no matter if they are meant to be living or dead. I don’t think its a masterpiece but you can tell there is a lot of effort and heart being placed here even when it starts to lag at times. This is my definition of the kind of movie that is mindless but ghostly fun at the same time.